Octave pedal is an important part of a pedalboard as it allows guitarists to change their tone hassle-free and create unique playstyle. But there are various choices in the market, as well as opaque assumptions about octave pedals. After a careful and comprehensive research, we made out this list of the 7 best octave pedals for guitarists and resolves the most common myths about them for you. How to choose the best octave pedal for guitar? Most popular brands are manufacturing best octave pedals in the industry. OC-3 is an octave-down pedal, what it can do is to change the pitch of your signals by an entire octave. It’s simple but very useful. The maximum interval you can go is 2 octaves up or down. It’s enough changes to fit many songs and playstyle. 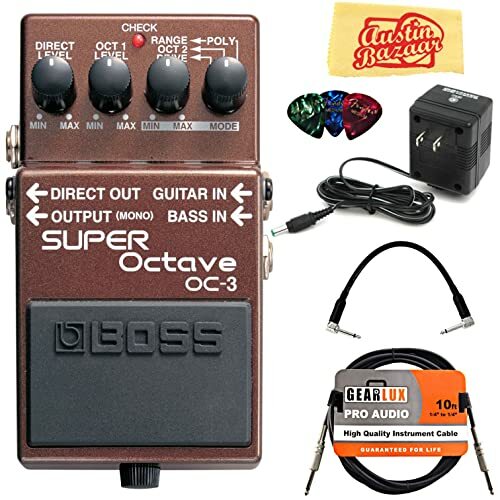 BOSS OC-2 is famous and pursued by many guitar enthusiasts in the past. And its descendant, OC-3, inherits any good things from OC-2, including the “dual octave” effect. Dual octave effect creates a harmonious, beautiful performance by mixing your dry signals with a pair of synthesized altered signals. If you go up, one altered signal is in 1 octave higher and another is in 2 octaves higher. The same things happen when you lower the pitch. BOSS OC-3 is the world first compact effect pedal that has polyphonic tracking. It means that it can track all of your signals, from a simple note to a complex chord. Now you’re free to input any favorite melody and playstyle without tweaking your pedal a lot. There’re more interesting features in this little, compact effect pedal. It is Drive mode, which adds distortion to your signal to make it stronger, more impactful. If you want some rock and metal to your song, you can easily grab a bass guitar and connect it with the pedal. OC-3 supports Bass input, it will change its effects to fit the scale of a bass guitar’s sound. OC-3 has a good signal tracking, it can track the most complex chords. And because it’s a compact pedal, you can pair it with other effects to create your own, unique pedalboard. This allows you to create a personalized musical effect within the desired budget. 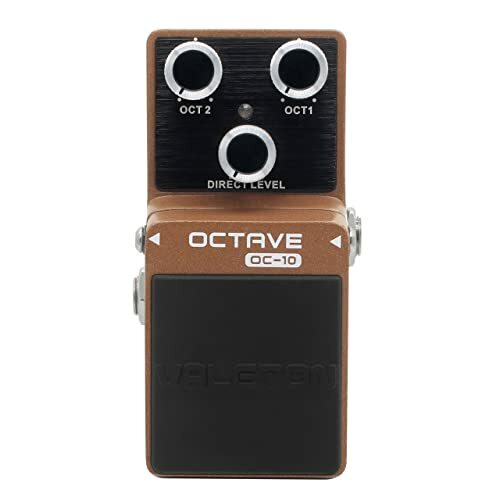 Valeton OC-10 is another octave-down pedal like BOSS OC-3 but comes with more affordable price. The best thing about Valeton OC-10 is that it can fulfill the job of an “octaver” very well. It can blend your notes with an altered signal of 1 octave or 2 octaves down, or even with both of them to create a new, interesting effect. The product makes use of a buffered bypass to store signals when the pedal is unpressed. This feature helps reduce high-frequency signal loss. Valeton OC-10 provides simple control and moderation. There are only 3 three knobs: OCT 1 and OCT 2 knobs to adjust the octave-down effect, and the DRY knob to decide the level of the blend effect. This is more useful and suitable for beginner and practicing. Doesn’t contain as many extra features as costly products, Valeton OC-10 tries to be better at other aspects. It’s the material. The effect pedal is made of die-casted zinc-alloy to increase toughness and durability. This also helps remove unnecessary vibrations for songs which don’t need them. Other parts of the pedal are also made of heavy metal to withstand pressure and physical shocks. The negative thing about this octave pedal is that it is monophonic tracking. That means although it has a good tracking ability, Valeton OC-10 may struggle to detect complex chords. Despite having the smallest size in this list, Mooer Pure Octave is pretty much feature-rich and well-performance. It may be the best octave pedal for beginners and budget customers. Unlike 2 above compact effects, Mooer Pure Octave isn’t only an octave-down pedal, it is also an octave-up pedal. This means it can shift your notes up or down based on your choice. You can control this feature through 2 dedicated knobs, the SUB knob is for octave-down and the UPPER know is for octave-up. Beside manual adjusting, this effect pedal also offers 11 different effect settings. Each of them refers to a different combination of synthesized signals: +2+1 means one signal is 2 octaves higher and one is 1 octave higher, etc. And you can also choose the two altered signals to go in different ways from the original note, for example, +1-2 means one signal is 1 octave higher and the other is 2 octaves lower form the dry input. This is a convenient and helpful feature for quick set up between different songs. 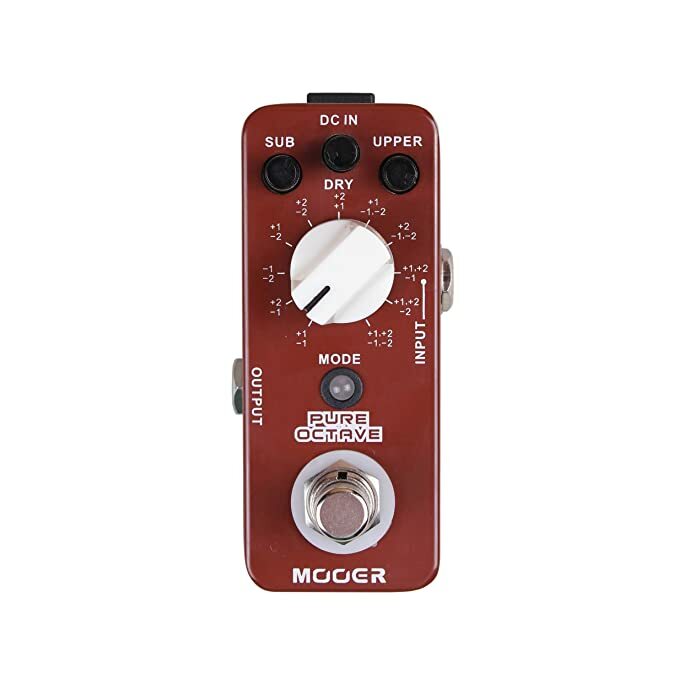 Although small and cheap, Mooer Pure Octave is a polyphonic octave pedal. This indicates that the effect can track any kinds of signal, whether it’s a note or a chord. The tracking ability is also good, and the effect is true bypass, which reduces signal loss and retains your precious original input. 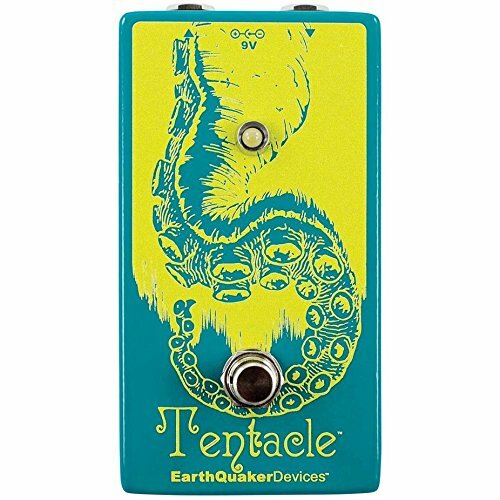 EarthQuaker is well-known for insanely interesting products, and this Tentacle is the best example. Have a look at it and you will recognize the difference: there is no knob or control at all. The only you can press is the power button to turn the pedal on or off. This Tentacle V2 is an octave-up pedal, the pedal will track any of your input and process it to create higher notes. But no knob means that you cannot control the pedal but rather let it decides how much the effect should be. It is easier to be recognized when you play higher and higher, especially at the 12th fret. But if you still desperately want some control over the pedal, you can make it through your guitar’s tone controls. This effect pedal is analog tracking, it can produce a natural and continuous output as your input. But it has trouble with chords. When playing a chord, the analog effect pedal will create some “warbling” sound as it cannot detect and follow all notes. Therefore, the Tentacle V2 will create ring modulation as heard in ring modulators when you’re playing a chord. This effect makes your signal a little robotic or alien-like by adding some fuzzy, stuttering elements. Compared to the Tentacle V1, this updated version has a new Flexi-Switch ™ feature. This feature allows you to use both latch and momentary footswitches at the same time. The effect pedal also has true bypass, helps reducing signal loss when it’s in either latch and momentary mode. There isn’t a common need for an only-octave-up pedal but the octave-up effect still brings some outstanding, explosive effect to your performance, as Jimi Hendrix did. This little stompbox has every fundamental feature a guitarist needs, such as polyphonic tracking, true bypass,… But there’s a lot more in this little Sub ‘N’ Up stompbox, a bunch of unusual and innovative features. Most modern guitar effects are polyphonic pedals to be able to track all input signals, whether they are notes or chords. Although Sub ‘N’ Up is polyphonic, it also allows users to switch to old-school monophonic tracking. It’s something unusual but very useful, especially when you want to add something new and interesting to a simple melody. This effect pedal contains three knobs to adjust the shifting effect. You can choose to shift your tone up by 1 octave, or shift it down by 2 octaves. Or you can even blend the three signals together to form a harmonious combination of four synthesized signals. This is flexible enough for you to create your own unique and outstanding tone. 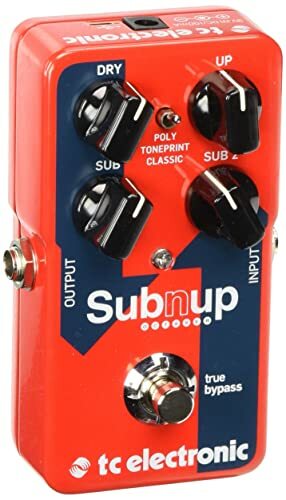 Another unusual feature of Sub ‘N’ UP is the ability to change from true bypass to buffered bypass through a switch, and vice versa. When true bypass is activated, your original signal will be transferred directly from the input to the output without interruption. When buffered bypass mode is on, your dry signal will be kept in buffered bypass to reduce signal loss due to long cable and high-impedance materials. There is also a Kill-Dry technology applied to remove dry signal patch for reaching 100% wet signal in parallel effects loops. However, the most impressive feature of this guitar effect pedal is the integration of technology. Sub ‘N’ up uses TC Electronic’s exclusive, patented TonePrint technology. Via a free mobile app, you can choose one in hundreds of unique and novel tone, then transmit it into your pedal. This helps you cut time for a trial-and-error process in finding a perfect tuning. If you want a more personalized and signature effect, you can make it yourself through a powerful TonePrint Editor in a PC or laptop. 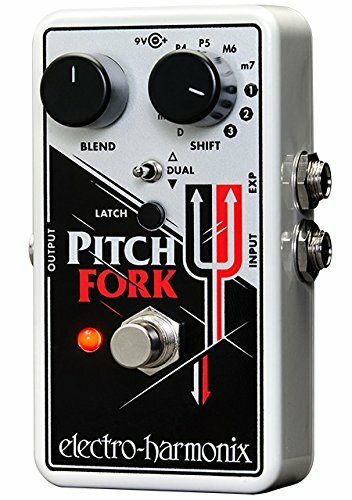 Comes from Electro-Harmonix, this elaborate and powerful Pitch Fork is one of the best octave pedals for guitar in the market. There is one Blend control for activating or deactivating the pitch-shifting effect. Once turn in on, it will process your dry signals and produce synthesized signals. The SHIFT button on the right side has a scale with the different level of pitch. You can use it to adjust how higher or lower you want your output signals are. Your choices vary from Minor 3ns, Perfect 5th, 1 octave or even 3 octaves higher or lower than the original pitch. There is a total of 11 different options for you to choose from. If you want more mysterious, harmonious effects for the signal, you can push the toggle in the middle of the pedal to switch to dual mode. In this mode, two synthesized signals will be played at the same time, one is your choice and another is at a higher or lower tone. This creates the Harmony effect, which is more pleasant and immersive as if you’re using a harmonizer. An effect pedal for guitar often comes with a footswitch of either latch-type or momentary-type. This requires customers to buy the right footswitch to be able to use the effect. But this Pitch Fork makes it easier for you because you can use either latch or momentary footswitch with it. You just need to press the Latch button to switch between modes based on your type of footswitch. When the effect is one Momentary mode, there is a delay between the time you press the pedal and the moment it process the signal, called glissando rate. This rate may be different but not longer than 60 milliseconds while the Momentary mode is on. There is also an EXP input for you to attach an additional Expression pedal. It will help you adjust the tracking speed in Momentary mode, as well as have more control over other aspects of your effect unit. DigiTech Whammy was an innovative, spectacular pitch-shifting pedal when it was released in 1989. Until now, it has 5 generations. And DigiTech’s latest model, Whammy DT, is an effect pedal which inherits all the features of its ancestor while incorporating many amazing features. 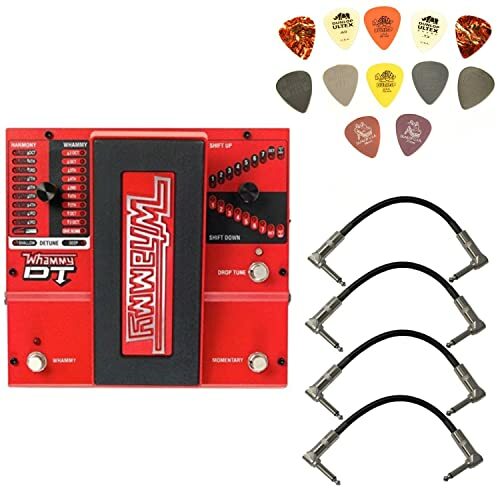 Whammy DT is a guitar multi-effect pedal, can be considered as a pitch and octave effect, a harmonizer, and a drop tuner. On the left side of the pedal, there is a part for Harmony and Whammy effect. There are 10 Whammy settings, each will bend your notes up or down with a different interval. The highest intervals you can go is called “Dive Bomb”, which promises to create an explosive performance. For harmony, you also have 10 options, each will create a more or less warbling sounds for your notes and chords. On the right side, you will see the other two divergent lines of indicators, one goes up and one goes down. This is the Drop tune pedal: once it’s on, the Whammy DT will shift your dry signals up or down for the desired interval. You can go for a half-step to 7 half-steps or even an entire octave. As it’s loved by many artists, so it also needs the flexibility to adapt to many situations and playstyles. Thus, the Whammy DT offer a toggle to switch between Latch and Momentary mode. But better than the above EH, Whammy DT has no delayed tracking time in Momentary mode because it’s true bypass. In general, this effect pedal has a perfect tracking ability, almost instant when you’re playing a note. This Whammy DT comes in a package, which also includes 12 Dunlop PVP101 picks and 4 6″ right angles. The picks are really lovely additions, they have different, beautiful patterns for you to make up your style. Octave pedals and other effect pedals have many specifications. 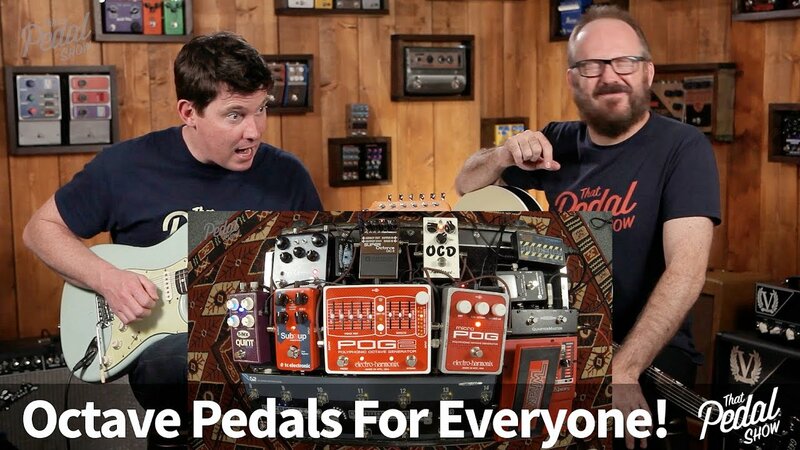 You need to know how important each specification is to judge the pedal’s performance before actually buying it. The purpose of effect pedals is to shift your notes higher or lower for a number of intervals. For octave pedal, it can shift your tone one or two octaves. Thus the maximum range of octaves defines the performance of an octave pedal. The octave pedals which support more intervals offers more choices for the guitarist and musicians. They will have a number of adjusting levels and combinations to create their own music style. This is a significant reason for them to choose among various effect pedal. In summary, the higher the range is, the better the pedal is. You should always look for octave pedals which allow shifting more octaves. Most products in the market allow you to shift up and down to 2 octaves from the original signal. Some high-end devices also let you ascend up or descend down to 3 octaves. If you have an unlimited budget, these are effect pedal to buy. But sometimes it depends on your desired music style you want to play. Pitch-shifting pedal is a close relative to octave pedal. In fact, the pitch-shifting pedal is a more complex effect pedal than octave pedals. A pitch-shifting pedal can shift your signal for an interval that is more or less than an octave. It may be 1 note higher, 3 step (interval on guitar) lower, or a semitone higher. The adjusting levels of a pitch-shifting pedal are often more than that of an octave pedal, thus it can be used as an octave pedal with the appropriate setting. Moreover, pitch-shifting effect pedal is often multi-effect, meaning it can offer more effect than shifting your tone up and down. Therefore, you can buy a pitch-shifting pedal or multi-effect pedal to use as an octave pedal but with more detailed settings and spectacular effects. But rules also apply to pitch-shifting pedal, the longer pitch range is the better. The octave range defines how far you can go with the effect. But there is a bunch of effect pedals which have incredibly long octave range work badly. They usually make unexpected warbling, distorted sound, especially when users are playing chords. It’s the matter of tracking ability. Every effect pedal has a different tracking signal capability. Technically, there are two types of tracking: analog and digital. Every time a guitar string vibrates, it transfers an analog signal into the pedal. An analog tracking pedal will store the signal in its circuitry and produce the desired effect. The output thus follows exactly every bit of the analog signal, even at the highest frequencies. Meanwhile, digital tracking doesn’t store the analog signal. Rather, it processes the signals right in the input by modeling them, then transfers the modeled signal to its circuitry. However, contemporary technology has a limitation, digital tracking can’t follow all frequencies of the signal. It fails at modeling high frequencies notes, creates aliasing when the pitch goes up. This is the reason why analog tracking is widely used and love hundreds of guitarists. Some also say that the sound of the analog tracking effect pedal is warmer and more natural, while digital tracking produces sterile, interrupted output. But you can still utilize digital tracking pedals for some situations, such as: playing songs that are not very high, or needing a little weird, digital sound for making a movie. Another difference in terms of tracking ability is monophonic and polyphonic. As you will see in the name and description of many modern guitar effect pedals, there is a phrase “polyphonic”. Polyphonic means the effect can track many notes at the same time, allows you to play either a simple note or a complex chord. You will be able to make your melody more harmonious, to highlight your favorite part of the song, or even to show off your brilliant skills. On the other hand, monophonic tracking pedal can only track every single note. It’s only suitable for beginner, practicing or playing a simple song. Not many of the modern-day effect pedals is still monophonic tracking, the most famous exception is the EarthQuaker Tentacle mentioned above. In summary, the best choice overall is an octave pedal with analog and polyphonic tracking ability. This guarantees you the most stable performance in most situations. The other choices are still useful in certain conditions, but you need experiences and knowledge to make use of them. Bypass type plays a significant role in the pedal’s output quality: reduce original, unaltered signals. There are two types of bypass: true-bypass and buffered bypass, and a lot of myths between them. Many manufacturers that use true bypass advertise their product as the best bypass, but others who use buffered bypass also received credit and acclaim. So which is truly better? You need to dig a little deeper to get the right answer. There is always a circuitry inside every single effect pedal to process the signal and produce the desired effects. When the pedal is on, guitar’s signals which are transferred to the circuitry are being altered. In contrast, when the pedal is off, the signal will not be processed. But the fact is: there are still some signals getting affected when running through the circuitry. Then the original signal is lost at some degree. The true-bypass is born to solve this problem. True-bypass effect pedal has a smart switch to help the signal bypass the circuitry. Then, they will go directly from the input to the output. None of the frequencies of the signals will be affected, thus remain the same as the original. Either the effect pedal is on or off, the sound will be clean and pure. However, it’s not only the circuitry that moderates the signals. Every musical instrument has impedance – resistance against electricity – that effects the preservation of the signal. The impedance is getting higher when you have a long cable, especially over 19 feet, and when you have many effects in your pedalboard. When the analog signal goes through these high-impedance materials, it loses energy. As a result, your sound will be changed. It’s not what a true-bypass can solve – it’s only inside the pedal, but things are effected outside. There comes the buffered bypass, which is used in almost all BOSS models. When input signals enter the pedal, they are stored in the buffer. Then they are processed and strengthened to fill up the lost signals. Thus, buffered bypass effect pedal preserves the tone of your input. Even if you run a long cable or many high-impedance pedals in your rig, there will be no significant signal loss that human ears can detect. But, of course, buffered bypass also has a drawback. Sometimes it will change your tone a bit based on the quality of the device, processing program, and technology. In summary, true-bypass retains the player’s input but gets trouble when the cable is too long; on the other side, buffered bypass mitigates the signal loss of high-impedance instruments, but may affect the original tone. Electro-Harmonix is a pioneer and one of the oldest figure in the electronic audio processor industry. The most successful period for EH is the 70s when they introduce the most advanced effect pedals: first stomp-box flanger, first analog echo/delay unit without moving parts, first tube-amp distortion simulator, first pedal-like guitar synthesizer, and the world first delay/looper pedals. Whether in the past for the present, EH is always famous for elaborate, high-end gears and equipment for professional players. It’s products range from advanced and complex audio effects to easy-to-use and affordable for the mass market consumers. DigiTech is the first company making audio processors, but it’s the manufacturer that offers the most famous products. In 1989, DigiTech introduced its Whammy, the first foot-controlled pitch shift effect. Whammy was a blessing on guitarists who plays with both hands so have no other ways to adjust the effects. Later, DigiTech also brought to the audio electronics other exceptional effects pedals, such as Bad Monkey Tube Overdrive – an excellent overdrive pedal, Digitech Trio+ – a stompbox that mixes bass and drum. DigiTech’s goal isn’t extremely advanced devices as EH, a lot of their gears are easy-to-reach for average and beginners players, rich-feature though. Japanese brands appear in almost all electronics industries, so do in audio processors. Boss is a branch of Roland Corporation, a Japanese giant in electronic musical instruments and software. Boss is more focused on making musical equipment and accessories. Their effect pedals have a strong and stable competition with American’s brands. There are many famous guitarists and musician who use Boos’ gear: Adam Jones, Jeff Hanneman, Slash or Jonny Greenwood,… but the most famous one is Eric Clapton, the only three-time inductee to the Rock ‘n Roll Hall of Fame. Boss Corporation has made a lot of different musical equipment, such as effect pedals, multi-effects pedals, harmonizers, and electronic tuners, etc. Although not having an exceptional achievement, Boss’s products are still famous about efficiency and reliability. Its signature characteristic is the “buffered bypass” footswitch in all models of pedals. The bypass preserves all input signals for more accurate processing and output even the cable used is too long. Not only creative, but EarthQuaker’s products are also insanely simple, efficient and fun. EerthQuaker tries to remove as many complex controls as possible, only left some fundamental knobs and buttons. The devices can smartly understand the desired output and intuitively incorporate with user’s signals. Therefore, customers often feel interested, comfortable and hassle-free when using every product of the brand. Mooer, the full name is Shenzhen Mooer Audio Co., Ltd., is a Chinese corporation that creates effect units. The company is well-known for its extremely compact pedals. The smallest Mooer effects are the Spark series, which has a pocket size as a retractable tape measure. In addition to the small proportion, each Mooer pedals is capable of doing a certain job, such as octave pedal, distortion pedal, echo,… Therefore, users are easy to customize and chain them together to form their unique pedalboard. Although small and simple, Mooer pedals are good at fulfilling their job. They are also being applied latest technologies to perform better and catch up with other leading brands on both bass & acoustic prefered. We hope this comprehensive octave pedal reviews can help you to find a perfect guitar effect pedal for yourself.